Now that Jay Z is his promoter, Andre Ward needs a challenger. 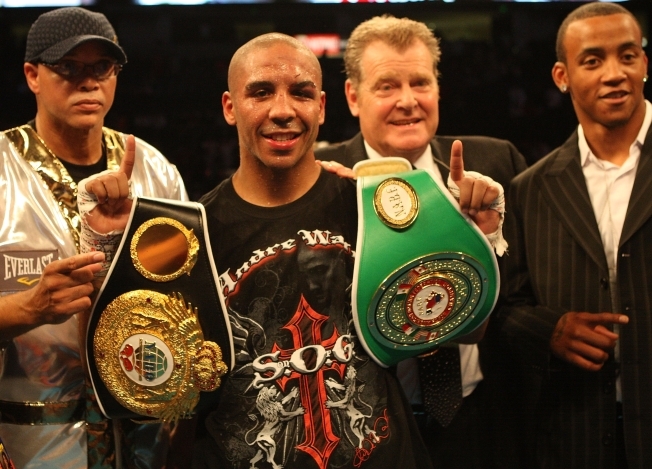 Andre Ward after a 2009 fight. Andre Ward hasn't fought since Dec. 2013, following a long dispute with his former promoter who died last fall. Now he has a new promoter -- none other than a promoter headed by rap impresario Jay Z -- and the current WBA super middleweight champion wants to fight in Oakland. So all he needs is a challenger. And he could have a familiar face. Former super middleweight champion Mikkel Kessler has just announced his retirement, but the 36-year old told a Danish newspaper that he could be lured back to the ring if he fought "the best of the best," according to ESPN UK. That would be someone like Carl Froch or Andre Ward. Ward is one of three fighters to beat Kessler, the website noted. Meanwhile, there are serious questions as to who Ward should fight and when the next time he puts on the gloves. The Oakland-born Olympic gold medalist, who is 27-0 in his pro career, says that he wants to fight as soon as April, and that he wants to do it in Oakland. But he hasn't fought since his 20s, and he'll be 31 in three weeks, the Bay Area News Group reported. Ward is the first and so far the only boxer represented by Jay Z's Roc Nation.